It’s the “Andy Griffith” of the calendar months. Everybody likes October: the smells, the tastes, the colors and the cooler temperatures. I like October, too, but for less obvious reasons. For starters, October marks the end of another long, sweltering, Southern summer. In October, the sun rises later and goes to bed earlier which means more sleep for us all. October doesn’t have the pressure of December nor the disappointment of January. It really is a near perfect month. As if these reasons were not enough, October also offers the best of college football, post-season baseball, earthy soups, knee-high boots, wool scarves and wood-burning fires (just to name a few). It seems like there is a hardiness to life that falls fresh every October. Some sort of cinnamon-spiced optimism is in the air, a lightness of being, making the season plump and round with hope, like a pumpkin. I know, I know. I just went through all the warm and fuzzy reasons why I “like” October only to admit that I really don’t like it all. I mean, I want to like it but honestly, my feelings are a corn-maze of emotions that have nothing to do with mums or hay bales. For me, October is a mixed bag of good and bad not unlike my child’s stash of Halloween candy; right next to the king-sized Snickers is a marshmallow circus peanut. With October comes an emotional equinox in my soul. The “good” days grow shorter as the “hard” nights grow longer. In other words, I’m not very happy. After the thrill of ordering my first pumpkin-spiced latte from Starbucks is gone, I begin to feel like the picked-over pumpkin patch at Old Baker’s Farm. October is full of anniversary grief. My mother died on the most beautiful day in October. Two weeks later, my dad died. A few years after that, my marriage died on an absolutely, gorgeous October afternoon. It was my husband’s birthday. The sights and smells of fall bring joy to most but offer painful reminders to me; harvest moons, leggy impatients, pumpkins, candy corn, leaf piles and scarecrows feel more like tricks than treats. Before my parents passed, both labored for extended seasons in the ICU. I spent the entire month of October at Brookwood Hospital. Day after day, I drove across Red Mountain watching the leaves bleed fall colors. I sat in the ICU waiting room and watched Alabama lose to Tennessee on the third Saturday of that October. A week later, I watched the Red Sox beat my beloved Yankees in the ALCS. My mother died two days after Boston won the World Series. It was officially the worst October ever. It was a month fueled by hospital coffee (none of which was fall-flavored) and raw adrenaline. I left in the dark and returned in the dark. Rather than feeling like the sun was doing me a favor with the extra hours for potential sleep, it just seemed lazy. All of life was harder. I had no time to unpack sweaters or scarves once the weather changed. I chose tennis shoes rather than knee-high boots since I often had to run up five flights of stairs taking two steps at a time to make it to my parent’s side after a call from the nurse. There wasn’t a soup or a fire warm enough to comfort my stiff body after 34 days of living and dying in the ICU. The usual gifts of fall were not mine to enjoy that year and truthfully, October has never really been the same. My mother had a birthday in October, so while she lay dying, I brought her presents. 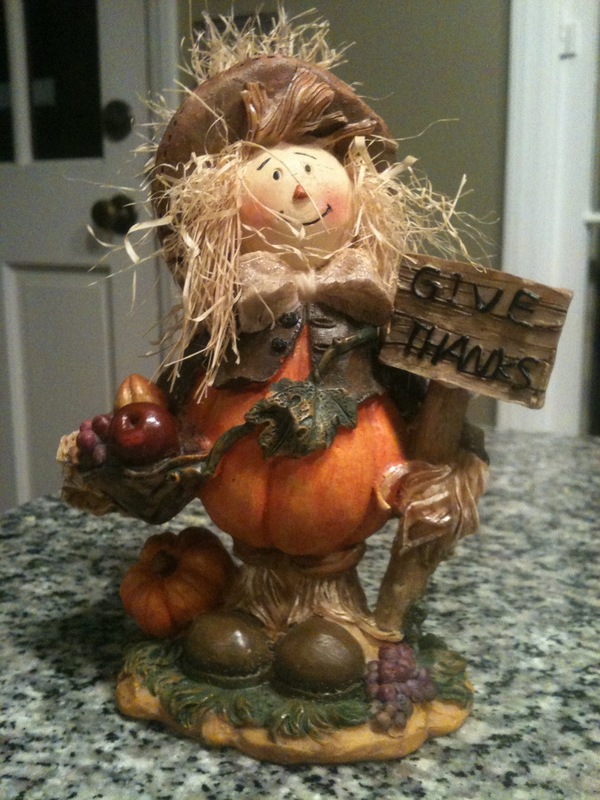 One of these gifts was a ceramic figurine of a happy, little scarecrow holding a sign that read, “Give Thanks.” It was hard to give thanks for a dying mother. It was impossible to give thanks when my dad died and by the time my marriage was gutted like a jack-o-lantern, I was hollow. Losing both of my parents made me feel like an orphan. Losing my husband made me feel like a widow. The potential for gratitude-sucking sorrow and self-pity was (and is) great, especially this time of year. I am tempted to gorge my victim status like my son stuffs his face with Halloween candy. But wouldn’t we both feel terrible if we did that…..again? The word “autumn” means a time of full maturity (especially in the late stages of growth). I have been maturing and would like to believe this is my time to experience some fullness of that growth. I am ready to harvest a new season of hope. Jesus is the cause for this autumnal change in my heart. He is using my grief to do the impossible; making all things new. In allowing me to suffer and experience the reality of my deep need for Him, I have become the person I was always meant to be, my true self, my child-of-God self. He is making my faith complete through sorrow and providing a ministry of His Spirit experienced almost exclusively through heartache. I am ready to rediscover and reengage the beauty that is in and all around me. Since I am new at this, I’m not sure what naked honesty and unashamed living looks like. Remember, I am learning how to throw off my metaphorical fig leaves and return to the garden of my desires. Maybe living naked and unashamed will be a quiet introspection of my soul, a meditation on the miracle of mindfulness or a serious study of the Japanese Maple ablaze in my front yard. I have a feeling, though, it will not be that serious. I think living naked and unashamed will look more like jumping into a leaf pile, waking up to the first frost with wonder, thanking the leggy impatients for her endurance, drilling three holes into a pumpkin and bowling for gourds, gloating on the third Saturday of October, bullying a Red Sox fan and howling at a harvest moon (maybe Manny will howl with me). I am going to learn to like October again. Will there still be pain? Yes. Will I be tempted to feel like an orphan? No doubt. A widow? Before the day is over but rather than allowing it to lead to despair, I hope instead to invite Jesus to use my sorrow to reveal my design and satisfy my deepest desires for intimacy with Him. He lavishes me with these choice cordials. In the fires of my afflictions, I have tasted and seen that the Lord is good. My palette is refined for that of Christ alone and nothing else will satisfy; nothing. I am as brilliantly changed as the leaves on the trees. For this, I can give thanks. “I will not leave you as orphans; I will come to you.” John 14:18. “For your Maker is your Husband – the Lord Almighty is His name.”- Isaiah 54:5. 1) Do you have a season of “anniversary grief”? If so, could it be time for Jesus to redeem and harvest a new season of hope during this time? 2) Can you with honesty bring your hurt, anger and disappointment to Jesus without making yourself feel anything other than your grief? 3) The purpose of honesty is not to be unapologetic but to expose unbelief. What may the the Holy Spirit be attempting to expose in you that could lead to repentance and fresh faith? 4) What “choice cordial” has God lavished on you in your seasons of suffering? Thank Him for these gifts and His tender-loving care. Michele is a freelance writer. She lives in Birmingham, Alabama with her five children. Michele can be reached at michelebbullock@yahoo.com.